Who doesn't love this Tarantino classic? For every true lover of Pulp Fiction, this Pulp Fiction Frame Print deserves to be on your wall. Crafted to pay homage to the cool movie, this print features the cool cast in bright, vivid colours. 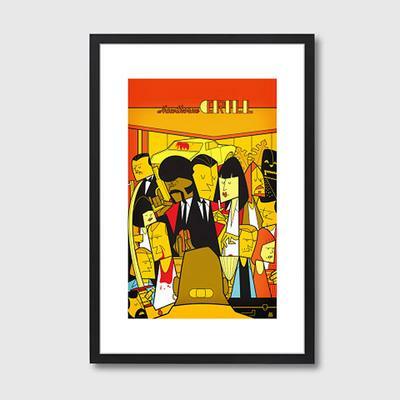 The artwork is made by Ale Giorgini and you can even catch several other pop culture prints he made here at the shop. As for this print, it's gorgeously placed under white matting and topped with a black wooden frame. Shatterproof and durable Perspex glass serves as the cover, protecting it from any possible damage. Find this in two available sizes: A2 or A3. You can hang this on your living room wall, bedroom, office or private study. If you like, you can even give this away as a present to a friend or family member who are fans of the movie.